Having in mind the fact that Adidas still refuses to withdraw its ‘USSR’ clothing line and publicly apologize for it, UCMC publishes its fourteenth visual reminder to the company. Nazi Germany’s blitzkrieg Operation Barbarossa drive the Soviet forces into a rapid retreat. This led to a serious logistical problem for the NKVD (Soviet secret police) which had to quickly evacuate thousands of prisoners, mostly those charged with political crimes, from across Ukraine. As a result, the NKVD began summarily executing huge numbers of prisoners while most of the remainder perished in forced death marches. Nearly 9,000 prisoners were executed in the Ukrainian SSR, and an additional 20,000–30,000 in eastern Poland (what is now western Ukraine). The total death toll reached approx. 100,000 victims of summary executions in the span of just a few weeks. Throughout 70 years of Soviet rule, the populations of Ukrainians, Crimean Tatars, Lithuanians, Latvians, Estonians, Georgians, Armenians, Moldovans, Kazakhs, and many other ethnicities were decimated, displaced, killed by artificial famine, tortured, persecuted, their lives, cultures, and livelihoods destroyed. 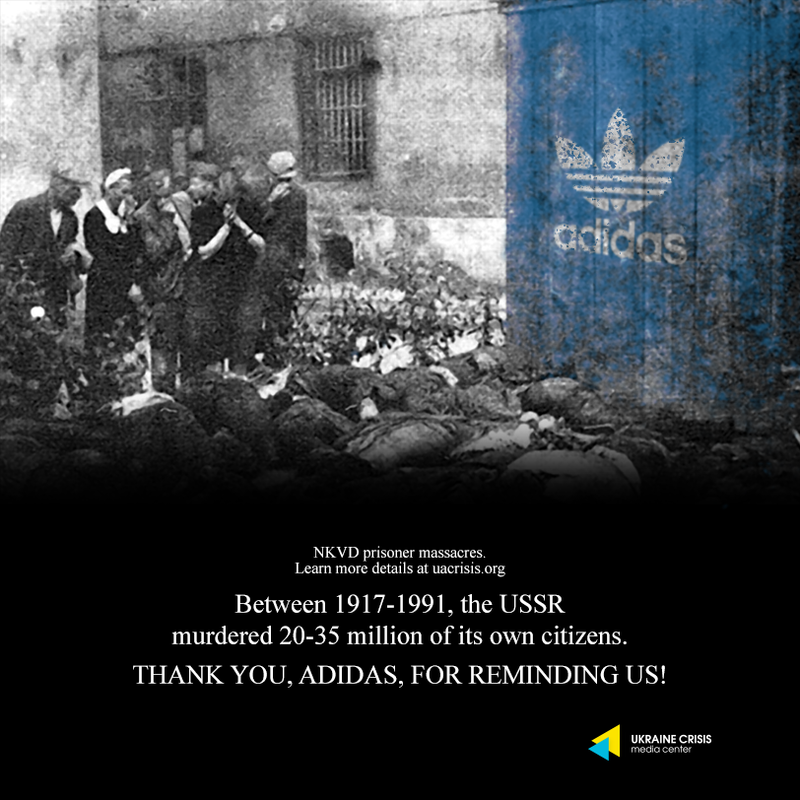 By using Soviet symbols for profit, Adidas is openly supporting the modern-day Russian state and its nostalgia for the USSR, a reckless obsession which led to the illegal annexation of Crimea and occupation of eastern Ukraine beginning in 2014. Since then, over 10,000 people were killed and over 1,7 mln people internally displaced as a result of Russia’s attempt to resurrect the USSR. We demand that the company recalls these products immediately from its online and offline stores and distribution centers and issues a swift and profound apology to all those affected by its morally repugnant sales tactic.